After many years of struggling with weight and health, we decided to try the Whole30 plan. We have read many different plans, and even tried a few. Nothing ever seemed to work well. I’m sure you are wondering about the title of our blog. We had 3 kids in 15 months, making a family of 5. It was a big adjustment. 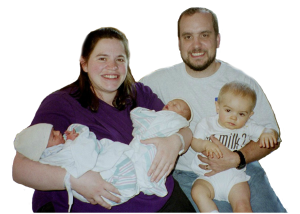 Married in 2001, 1st son in 2002, and then twin boys in 2003.